Tommy Hilfiger Ballerina Footies Socks fit just over the toes making them the perfect companion choice for all your low-fronted shoes. Made from cotton rich knitted stretch jersey, the Footies feel soft and easy-going, providing you with ultimate summer comfort. 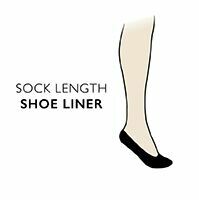 Liners such as these Tommy Hilfiger Ballerina Footies Socks, available in a twin pack, are essential when you want to put a barrier between you and your shoes, ideal for absorbing moisture from perspiration, and protecting your feet to keep them looking pretty and feeling good.